You’ll have a seat and we'll listen back to what you recorded. You may be delighted or you may be dismayed. You'll probably realize it's tougher than you thought it would be. You may be impressed at how good you actually are. You may realize that this is work you're really not cut out for. You'll have absolute confidence that your skilled, experienced coach is giving you honest information and not just trying to sell you more coaching. Special Benefit for taking the Voiceover Exploration -- free coaching on three sets of audio files. There is no "Voiceover Exploration II." I'm also not interested in setting you up for an endless string of expensive coaching sessions. You don't want to pay for them and I don't want to do them. (I'd rather be working behind the microphone, and these days, I'm busy.) So what do you do? You practice and prepare, like I tell you in the Voiceover Exploration. And then you do what I and other professionals do to get work. You record audio and attach it to emails. To say that again: You record three to five commercial spots (I'll tell you where to find copy) and attach them to an email. Then you do that again. Then you do that a third time. After each email, I give you my opinion and coaching. 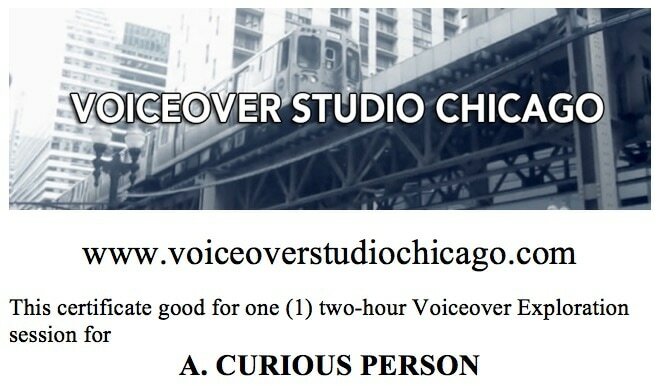 And I don't charge you a dime -- this is free for taking the Voiceover Exploration. When I get your first email, I listen to the attached files and say things like, "You're too far from the microphone" or "you're reading too fast" or "you sound like you hate hamburgers!" or "do you have a cold?" or "you need to sound more conversational" or whatever I hear that needs correcting. You read my notes and record another batch of three to five files, attach them to an email and ship 'em over. I coach on those. We do this one more time, and then you're aaaaall done. You're a perfected being or have achieved nirvana or Clear or some such thing. Okay, maybe not. More likely you just know one helluva lot more about what you're doing. If you're still having issues, we can arrange for more coaching. But if you've made it this far, and are still motivated to keep going, it's probably time to record a voiceover demo with me or someone else. I've not heard about other voiceover training that is geared toward this, and I don't understand why not. Recording at home and sending mp3s by email is how we audition for work in the 21st century. You need to know how to do this so you can try to make some money. That's why you're here! My thorough and detailed explanation of the voiceover business and how to participate in it, plus the free coaching follow-up, is why the Voiceover Exploration is the most valuable, cost-effective method for learning about the voiceover business available anywhere. Click here to send me an email and get started. Is there someone you know who's always wondered about using their voice to make money? Have they expressed interest in the voiceover business? Are you tired of hearing them talk about it, and want them to just go ahead and get the information they need? Give them a Voiceover Exploration gift certificate! Choose to receive a paper certificate or a pdf version sent by email. Pay for the session. The recipient and I arrange over email or by telephone for the day and time of their session.